Featured There is 1 product. 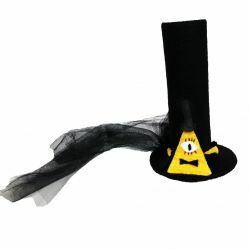 This is a handmade costume mini black top hat made of reinforced black felt. The top of the hat is adorned with the Eye of Providence also known as the All Seeing Eye. Black lace-like tulle compliments the brim and hangs off the hat about 8+ inches. Hat fastens to head with hair clips. Great for cosplayers, conventions like comicon, and Halloween.